Its here…the 2015/16 fixture list! It all begins Saturday, August, 8th. Finally, they made it to the Premier League. It took a while but next season the Premier League, for the first time will see…. 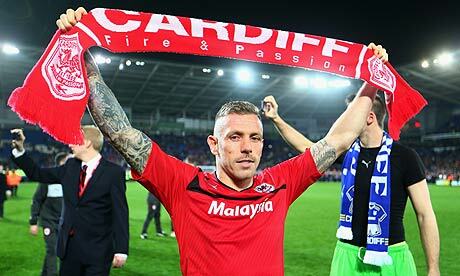 Cardiff City will return to the top flight for the first time in 51 years. With Swansea City already there, it will be the first-time Wales has had two top-flight clubs. The Championship for the past few years they have missed out on automatic promotion (after leading the pack for most of the season) by a sudden dramatic loss of form in the closing weeks of the season and found themselves in the play-offs – at which point they fell at the final hurdle and their dreams were shattered. This season, despite a couple of shock loses in February and March, they managed to hold on and secure their place as champions. Be it financial backing, strong leadership, team ethic, a solid defense or a change in shirt color (going from blue to red in the summer of 2012), something has made the difference to the fortunes of the boys from South Wales – good Luck Cardiff – life is certainly about to become a lot more interesting for you! British-based company Hawk-Eye, which rose to prominence for the use of its successful ground breaking technology in tennis and cricket, has won the contract (over rival German firm Goal Control) to supply all 20 Premier League grounds in the country (during the close season) with the goal line system that has the potential to transform the game. As of next season there, in theory anyway, will be no more shouts of ‘we was robbed’ – the customary reaction when a perfectly good goal is not given because the linesman was either caught nodding off, hadn’t managed to keep up with play, or was totally useless – had failed to see the ball cross the line. Having transformed line calls in tennis, the camera-based system provides instant replays, thereby allowing the referee to see whether a goal has been scored. A truly valuable piece of equipment given how many good goals have been disallowed, which has played a major impact on the results of many crucial games – the most prominent being the Frank Lampard “ghost goal” against Germany at the South Africa World Cup in 2010. England went onto lose the game and was eliminated from the competition in the second round. Had the goal been given, well who knows, but the point is, this technology will make a huge different and hopefully eliminate such controversial decisions. Welcome to you both – it will be interesting to see what lasts the longest….